Authors: REESE, W. D.; GRIFFIN, III, D.
Authors: REIS, C. M. dos; TANCREDI, A. C. F. N. S.; MATSUI, E.; SALATI, E.
Authors: PISANI, J. F.; KERR, W. E.; CUNHA, R. A. Authors: FERRARONI, José J.; DOURADO, H. V.
Authors: HAYES, J.; CHARLWOOD, D. C.
Authors: GABRIEL, C.; GOTTLIEB, O. R.; LIMA, R. A. de; MESQUITA, A. A. L.
Authors: GOTTLIEB, O. R.; MAGALHÃES, M. T.; OLIVEIRA, G. de; TRAINOTTI, A. 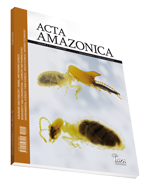 Authors: DIAZ, A. M. P. de; DIAS D., Pedro P.; FERREIRA, Z. S.; GOTTLIEB, O. R.; LIMA, R. A. de; CAVALCANTE, S. de H.
Authors: ARIAS, J. R.; FREITAS, R. A.